One day an invitation Came to number 24. It was from a next-door neighbour Who they’d never met before. The children can’t wait – a birthday party? What fun! But their next-door neighbour is not all he seems. For starters, there’s his large snout and very sharp teeth. Not to mention his scaly skin …Yes, there’s no two ways about it, he’s definitely a CROCODILE. Erm, crocodiles don’t eat children, do they? A riotous romp of a picture book, superbly written by Mark Sperring and brilliantly illustrated by Laura Anderson. 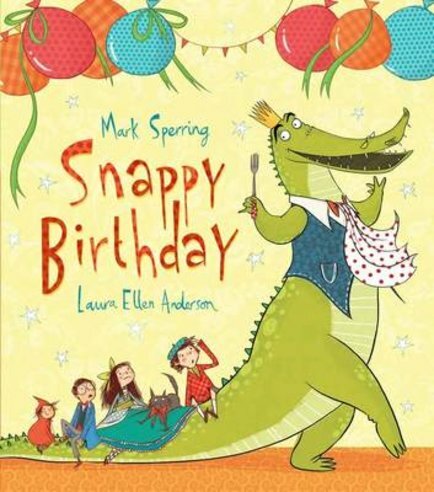 Snappy Birthday is the perfect present for any child – whether it’s their birthday, or not!